Wed, Jan 16, 2019, 08:34 pm SL Time, ColomboPage News Desk, Sri Lanka. 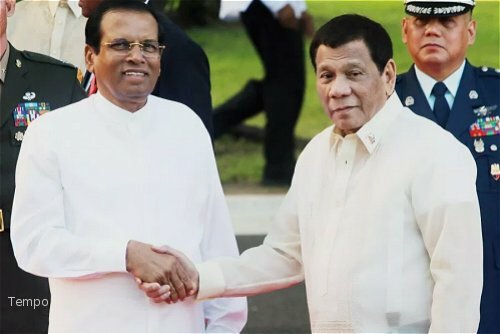 Jan 16, Manila: Philippine Rodrigo R. Duterte officially welcomed visiting Sri Lankan President Maithripala Sirisena at Malacañang Palace on Wednesday and held discussions on ways to further strengthen the bilateral ties between the two maritime nations. Welcoming the second Sri Lankan leader to have visited the Philippines since the establishment of diplomatic relations in 1961, President Duterte said the five-day historic visit of his Sri Lankan counterpart is held for a very good reason. "The Philippines and Sri Lanka are developing maritime nations. We face common challenges, we have shared interests, and we are united by our desire to provide greater peace, progress and prosperity for our peoples," Duterte said. The two leaders then held a one-on-one meeting and an expanded bilateral meeting. During their bilateral meeting, they discussed ways to further strengthen the two countries' engagement in trade, defense, agriculture, and tourism, education, cultural and people-to-people exchanges, official Philippines News Agency reported. The Philippine President said he and Sirisena renewed their commitment to adhere to the rule of law, to act as responsible members of the international community, and to work together constructively in all relevant regional and international organizations. President Duterte said the Philippines recognizes that Sri Lanka can be a partner in advancing migrant workers' rights and welfare; disaster risk reduction, response and management; as well as in strengthening their maritime security and addressing the trafficking of illegal drugs and human smuggling. Sri Lankan President said his historic state visit will lead to stronger bonds of friendship, enhance mutual understanding and reinvigorate cooperation, for the benefit of the two countries' peoples. President Sirisena assured Sri Lanka's cooperation in establishing concrete actions to address global and regional issues. "Along with President Duterte, I and my Government will ensure that these initiatives will be implemented in order to harness the maximum to the people of the both countries," he said. President Sirisena inviting the Philippine leader to visit Sri Lanka "at an early date" said President Duterte's visit to Sri Lanka will provide an opportunity to evaluate the progress of the initiatives they just discussed. "We will carry forward our discussion and consider further steps, to manifest thoughts into deeds," he said. President Sirisena's visit to Manila on January 15 to 19 was upon the invitation of President Duterte. Following the bilateral discussions the two Presidents also witnessed the signing of several agreements. • Memorandum of Understanding between the University of the Philippines Los Baños and the Sri Lanka Council for Agriculture Research Policy of the Ministry of Agriculture, Rural Economic Affairs, Livestock, Irrigation, Fisheries and Aquatic Resources Development (MAREALIFARD).